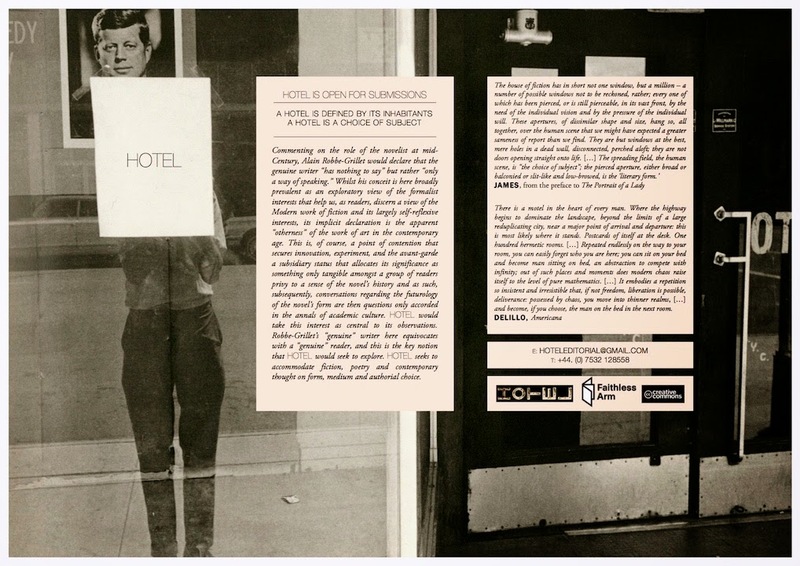 A Hotel is defined by its inhabitants: Commenting on the role of the novelist at mid-Century, Alain Robbe-Grillet would declare that the genuine writer “has nothing to say” but rather “only a way of speaking.” Whilst his conceit is here broadly prevalent as an exploratory view of the formalist interests that help us, as readers, discern a view of the Modern work of fiction and its largely self-reflexive interests, its implicit declaration is the apparent “otherness” of the work of art in the contemporary age. This is, of course, a point of contention that secures innovation, experiment, and the avant-garde a subsidiary status that allocates its significance as something only tangible amongst a group of readers privy to a sense of the novel’s history and as such, subsequently, conversations regarding the futurology of the novel’s form are then questions only accorded in the annals of academic culture. HOTEL would take this interest as central to its observations. Robbe-Grillet’s “genuine” writer here equivocates with a “genuine” reader, and this is the key notion that HOTEL would seek to explore. HOTEL seeks to accommodate fiction, poetry and contemporary thought on form, medium and authorial intentionality.